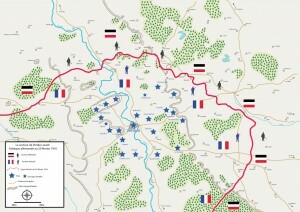 The Battle of Verdun took place on both sides of the Meuse, running west to east from the crest of Les Eparges to the Buttes of Vauquois both zones of violent fighting for the control of the heights dominating the Woëvre plain in 1915. 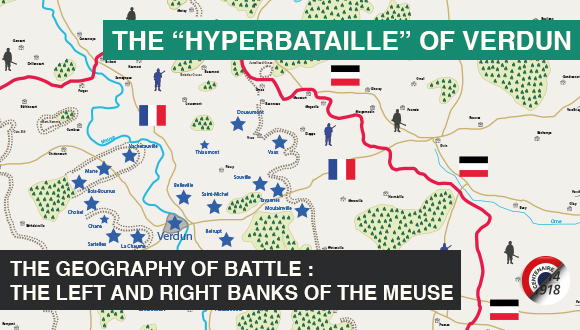 The main objectives of the 1916 offensive were the Meuse Heights. 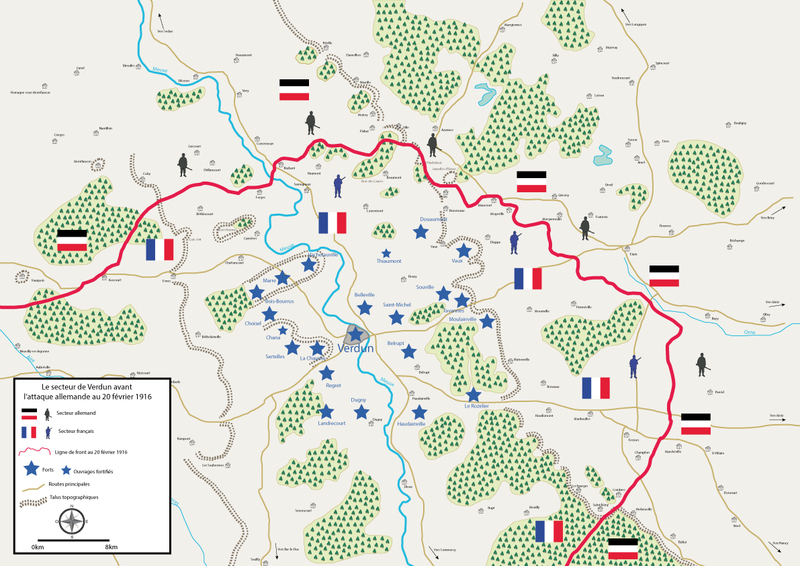 Between these two key points, the front stretched in a wide arc, at the centre of which stood Verdun located at some 15 kilometres (9.3 miles) from the front lines. It stopped near the village of Brabant-sur-Meuse where the Meuse River enters an extensive flood plain, some 19 kilometres (11.8 miles) north of Verdun. East of the crest of the Eparges the front crossed the fertile agricultural plain of the Woëvre and passed along the wooded slopes and ridgetops of the Meuse Heights standing 100 metres above its surrounding plains to finally reach the plateau just north of the village of Ornes. The front circumvented natural obstacles such as step-sided valleys and deep ravines that facilitated infltrations and forest edges such as Caures Wood that was ravaged during the German onslaught. On the left bank of the Meuse, the front stretched over a side plateau dominated by the Butte of Montfaucon. Facing south towards Verdun, two prominent hills rose on the horizon : Le Mort-Homme and Hill 304, the two major German objectives on the left bank of the Meuse.